Andy Law Pest Control install professional and effective solar panel bird proofing. We’re happy to install solar panel bird protection on both small and large scale solar panels. 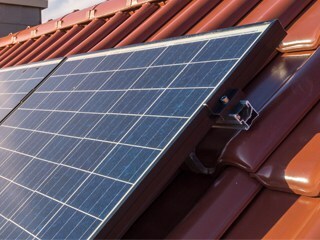 We use solar panel bird proofing that is professionally designed especially for solar panels: it is a permanent solution to stop birds nesting under solar panels. We also get rid of the birds at the solar panels according to Animal Welfare laws. We clear out the mess from under the solar panels and in the gutters too. And we’ve got the experience to install the solar panel bird proofing safely so the panels aren’t damaged. It is important to stop birds nesting under solar panels: don’t let the situation get out of hand. Birds mess under solar panels damages the roof and gutters and just a few birds can turn into many more birds over a short period, making it worse. If you’ve got birds at your solar panels then ring or email us for professional pest control advice about solar panel bird exclusion and how much it costs to bird proof and pigeon proof solar panels. We’ve 30 years’ experience in pest control and provide free solar panel bird proofing surveys. And we’re available 7 days a week for help and advice. We really do know what we’re doing: you can trust us to get it right. There’s more information below about solar panel bird proofing. Pest pigeons are the birds most attracted to solar panels. The space underneath the solar panels provides them with a secure roosting and nesting area, protected from the weather and predators. Then there is the bonus of the roof – the birds like to be on roofs because it gives them a high point to survey their territory. All in all, a dream combination for the pigeons at the solar panels but a nightmare for you. There are the birds themselves, being a nuisance by sitting on the roof and hanging around the property. They can be pretty noisy too, especially in the early morning when they’re out of bed but you are not! Then there are their droppings. Pigeons produce large amounts of droppings: piles of brown, oozing filth. They dirty the ground, paths and patios around the house and make a mess on the glass of sunrooms and conservatories. They wash down the roof from under the solar panels and block up the gutters and downpipes. The gutters and downpipes can get displaced and leak, causing wet patches on the outside walls, grass in the gutters and damage to the roof. And there is the rest of the mess that comes from pigeons, like feathers, egg shells, dead chicks and dead adult birds: these block gutters and downpipes too. And even worse, all the filth and debris produced by the pigeons can carry nasty diseases and well as being a breeding ground for flies and insects that could get into the house. To cap it all, pigeons that are reared on the roof will stay there to nest and pigeons from roundabout will come to the solar panels to nest as well. 2 pigeons can turn into 20 very quickly: that’s 10 times as many problems in maybe one summer. We use professionally designed solar panel bird proofing for solar panel bird protection. Our solar panel bird exclusion is made especially for solar panels: no drilling is needed during installation and no damage is done to the solar panels. The solar panel bird proofing is very long-lasting and is a permanent installation, unlike some solar panel bird proofing kit which comes loose after even just one year. And it is effective. We’ve visited many customers who have had a solar panel bird exclusion kit fitted but still had pigeons getting under the panels. In these cases we use our professional service to stop the problem – clearing out the pigeons and mess and fitting our effective solar panel bird proofing, as well as removing the faulty bird exclusion kit. Also, our solar panel bird proofing will stop all birds nesting under solar panels, not just pigeons. Each set of solar panels varies according to its position on the roof and the height and position of the building. Sometimes there are a lot of birds causing a problem, sometimes just a few. Maybe there is a lot of pigeon mess, or perhaps just a little. All these variable factors mean that the cost will vary from property to property and so each installation is individually priced. We can do a free visit to survey the problem. Then we provide a written, fixed-price quotation with no obligation. We can provide a quote for clearing out of the gutters too, as well as cleaning off bird mess from house walls. Specialist qualification in Bird Control.